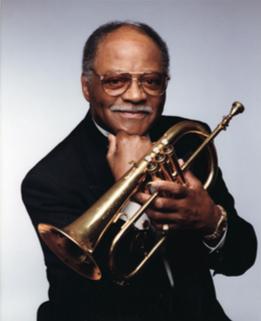 Clark Terry was my first real life musical hero. At the age of 13 or so, as a student listening in the audience at the UNH Clark Terry Festival, I certainly had no idea what he was playing, or just HOW important Clark was, but I knew I liked it. Not only did Clark make it seem fun, but he exuded prestige. It was quite clear to me then that jazz was a life worth living. As a young child, I could see clearly how intelligent Clark was, how capable, how diverse, how wise he was, and how happy he made others. My admiration for Clark only grew as time went on. I eventually found myself a student at UNH, lucky to be spending time learning directly from Clark! One day I summoned the courage to call Clark at his home in Haworth, NJ and ask if I might visit. With no hesitation Clark said, “Of course!” I feared he may not have remembered me. Not only did he remember me, he knew about my GPA and asked if I had successfully raised my grades! After my first visit, I was hooked. I stayed with Clark and his family almost every weekend, plus some full weeks over that summer. So many laughs, stories, and lessons. I couldn't stay away. When Clark’s wife, Gwen, offered me the opportunity to travel with Clark as his assistant and valet, I jumped at it. Traveling one-on-one with Clark off and on for a few years provided me some of the finest and most formative experiences of my life. Not only was I ceaselessly inundated with stories, lessons, jokes, jazz lore at its finest, but I was also given the opportunity to grow close to an incredibly strong, incredibly sweet, loving, dynamic man... almost a lifetime older than myself. Clark’s music, his lessons, the stories of the olden days, Clark introducing me to many other legends and heroes of mine, is all etched in my memory, quite preserved. What I value perhaps more than the jazz education of a lifetime are the memories of the man. Clark would never eat if I had not also been served. Clark would always ask about my significant other, about my parents, about my brother, and about his other students. Even when life was throwing him curve balls and the road was long and weary, Clark was always looking out for me. When it seemed like Clark might give up at any time, when I feared I might have to take the full burden on myself, Clark would always let me know that he was there for me too. As much as he was admired the world over, he always took the time to let the people around him know just how special they were and how much he loved them. I will remember the bright lights, the great tunes, being star struck, the meals, the limos, the flights, the friends. But above all I will truly miss his laugh, his handshake, listening to music together and singing along, sharing earbuds one in each of our ears, resting our heads on one another and zonking out for a nap. For me (and I’m certain for countless others) Clark was the perfect marriage of the magical and other-worldy, and the corporeal and, at times, brutally real. He was larger than life, capable of seemingly REAL magic! He could bring me to tears with a few notes. He could make me split my sides laughing. But despite his celebrity, his abilities as a performer, how ably he assumed the role of “boss,” he was constantly a real man, a good friend, a grandfather, a brother. Made of magic and made of flesh. A wise old man and an excited little boy. He brought us all on a journey with him, teaching us all the way, but not thinking twice when the time came for him to learn alongside us. I have Clark to thank for so many things. At this juncture I am only concerned with celebrating his life, listening to his music, and passing on his teachings and love for music and people. His love for the real, and his love for magic. Chris Klaxton is a Seacoast area trumpeter, a composer, and an educator at Plymouth State University, the Portsmouth Music and Arts Center, and the University of Southern Maine.